To celebrate our second award from Dogs Today magazine, we spoke to guest Abi about dog-friendly holidays with her pampered pooch named Badger. 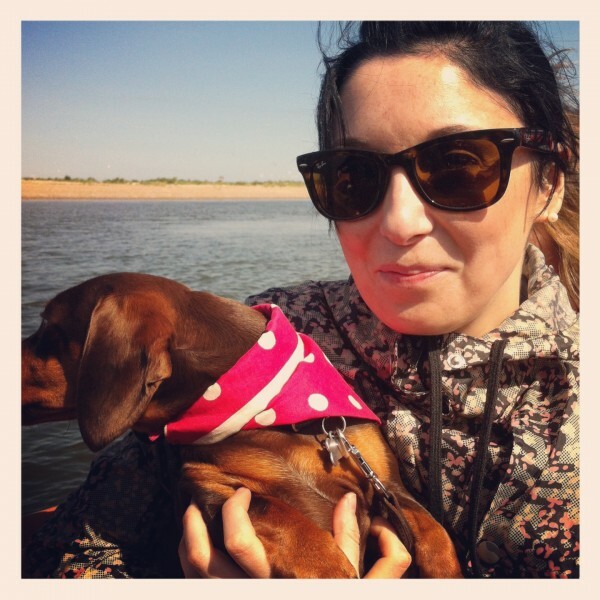 Abi Stacey, 32, from Essex, can’t get enough of holidays with husband Phil and their Miniature Dachshund, Badger. Personality: Feisty, super-friendly, high-maintenance, a real prince. Hobbies: Exploring in the garden, walking, trips out in his dog travel bag, snoozing under his blanket – even on a hot day. 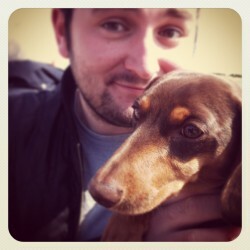 “We called him Badger because dachshund means badger dog in German. 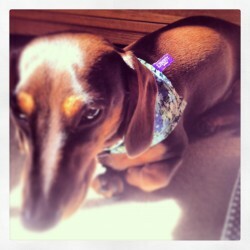 Dachshunds are bred for badger hunting in Germany, while the miniature ones are bred for rabbit hunting. We thought the name Rabbit was too girly and Badger suits him beautifully,” says Abi. For business owner Abi, Badger is a big part of her everyday routine, so when it comes to holidays she can’t imagine not taking him with her. “He stays with me at my homeware shop all the time. He’s got a huge fan base – it’s actually quite a good sales technique because people will come in on a regular basis to see him. Pictured above: Badger and Phil striking a pose. The pampered pet even went on the couple’s honeymoon to France. 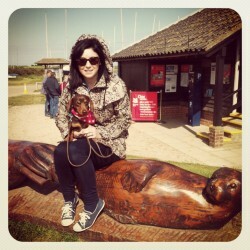 Abi’s friend who’s also a dog owner recommended Blakeney as a great holiday destination where they could take Badger. The quaint, cosy style of this charming cottage was perfect for them. “I love little, snugly houses. I’ve always been drawn to them and they suit Badger brilliantly with him being so small. “It was nice to have such a wide choice of dog-friendly accommodation and you could tell they were all lovely properties. You don’t often get that with other cottage companies,” says Abi. 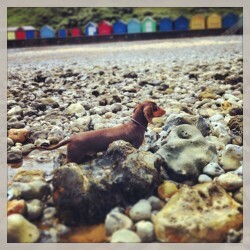 North Norfolk is Abi, Phil and Badger’s favourite holiday destination. For the Stacey family, the great thing about Blakeney is all the dog-friendly activities they can enjoy together. Pictured above: Abi and and Badger getting ready to see the seals. You can visit the Common and Grey seals in their natural environment at Blakeney Point. The picturesque, dog-friendly beaches make Blakeney a brilliant place for fluffy family members. “All the beaches were amazing. Badger loves playing in the sand. He’s got gorgeous short, silky fur, so any sand or dirt just brushes off him, which is really handy. Pictured above: Badger enjoying a stroll along the coast. Just west of Snettisham beach is the RSPB Snettisham Nature Reserve where you can enjoy spectacular scenery while walking or bird watching with your dog. Blakeney is full of dog-friendly pubs, restaurants and cafes – perfect for Badger, who hates to miss out on anything. “You can tell Blakeney is dog orientated because a lot of the shops and cafes put bowls of water outside for any thirsty dogs. Abi and Phil also took Badger with them to lavish evening meals out at restaurants like The Pigs and The Gunton Arms. Pictured above: Abi and Badger enjoying the scenery on their seal watching trip. Dogs love nothing more than your care and attention. As a big part of the family, it makes sense to bring your pooch along on a relaxing getaway. “I always feel really sad when people don’t take their dog away with them, because it’s a wonderful thing to experience. I think everyone should try it,” says Abi.